Congestion Management Agencies were created through the passage of Proposition (Prop.) 111 by California voters in 1990. Proposition 111 added 9¢ per gallon to the state fuel tax to fund local, regional and state transportation projects and services. It also required urban counties to designate a congestion management agency, whose primary responsibility is to coordinate transportation planning, funding and other activities in a congestion management program. NVTA receives state transportation funds, federal Surface Transportation Program (STP) funds and other funds that are apportioned to Urbanized Areas. It is also able to enjoy certain benefits as well as comply with the additional requirements of being a designated federal Transportation Management Area. Most people know we operate Vine Transit, the Napa Valley's bus system. But we also have other responsibilities: we oversee the planning and funding of paratransit (transportation for special needs and disabled riders), the maintenance and improvement of highways, streets and roads, and bicycle transit. As the program manager for the Transportation Fund for Air Quality, NVTA helps promote air quality in the Napa region. We also work with the Metropolitan Transportation Commission to coordinate funds from the Transportation Development Act (TDA) for transit, paratransit, streets and roads, and bicycle projects. Additionally, NVTA serves as the Abandoned Vehicle Abatement Authority for the allocation of funds derived from vehicle registration fees. 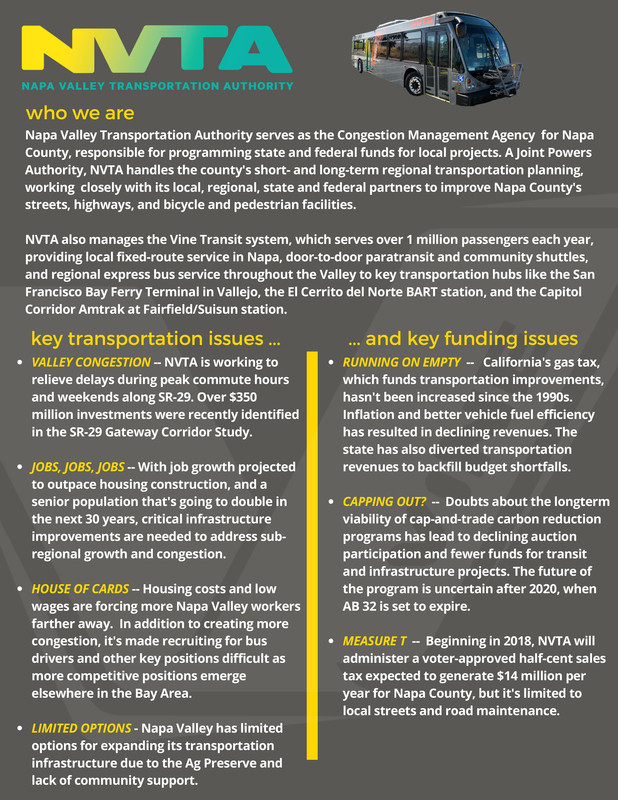 What plans are produced through NVTA? NVTA sponsor several plans and reports including the Countywide Transportation Plan (CWTP) and the Short Range Transit Plan (SRTP). The CWTP is a long-range policy document that guides decisions and articulates the vision for the County’s transportation system over a 25-year planning horizon. It lays the groundwork for an investment program and serves as Napa County's input to the Regional Transportation Plan. This plan is updated every four years. NVTA also develops long-range bicycle and pedestrian plans that are incorporated into the CWTP. This Short Range Transit Plan (SRTP) is NVTA and Vine Transit’s operating and capital plan planning document. The SRTP outlines the capital expenditure program and forecasted expenditures and needs for the next five years. The SRTP identifies short-range goals necessary to meet the 5-year planning horizon. The SRTP presents a general service plan and identifies specific capital projects needed to support the service plan. Capital projects and service plans are subject to approval by the NVTA Board of Directors. Revisions to projects may occur due to changes in VINE Transit goals and objectives as a result of State and Federal budget actions, changes in trip making characteristics within the service area, changes in VINE’s area of jurisdiction, or other unforeseen causes. The SRTP provides guidelines for making decisions that mitigate unanticipated changes. NVTA is responsible for updating the SRTP on a regular basis (every 4 years) to reflect changes and plan for project development and program enhancement. · coordinating planning and development that crosses jurisdictional lines, and generating and supporting legislation to coordinate local and regional policies on transportation investment. Who makes the decision on where tax dollars should be allocated? NVTA implements projects and programs approved by the voters through policy, planning and funding decisions made in public meetings. Members represent the interests of their local constituents, as well as all residents of Napa County who benefit from the investments included in the county transportation plans. NVTA has community advisory committees that make direct recommendations on bicycle and pedestrian funding as well as senior and disabled transportation funding. This enables local community members to be engaged in recommending how transportation dollars are allocated. How can I visit NVTA's administrative offices or the Soscol Gateway Transit Center? Where do I park? Locate the ticket office? Our beautiful new offices and transit center is located at 625 Burnell St. near downtown Napa just off Third St. Vine Transit's customer service office is located on the first floor near the east side of the building in the breezeway. The NVTA administrative offices are located on the second floor of the building, accessible by the lobby stairs or elevator. When visiting us, picking up or dropping off passengers, please use our parking lot located on the west side of the building just off Fourth Street. Please note: For the safety of our transit passengers and visitors, there is no automobile or taxi access in the front side of the building in the bus terminal area. That location is for buses and bus operations only. We thank you for your consideration.